I have proposed in the first part of the Pad Thai series that the best pan to use to make Pad Thai is a wide, flat-bottomed pan with a nonstick surface, short rims, and great heat retention ability. In the second part of the series, I have proposed that the best rice noodles to use in Pad Thai is flat rice noodles between 2 to 5 millimeters in width (measured before soaking). 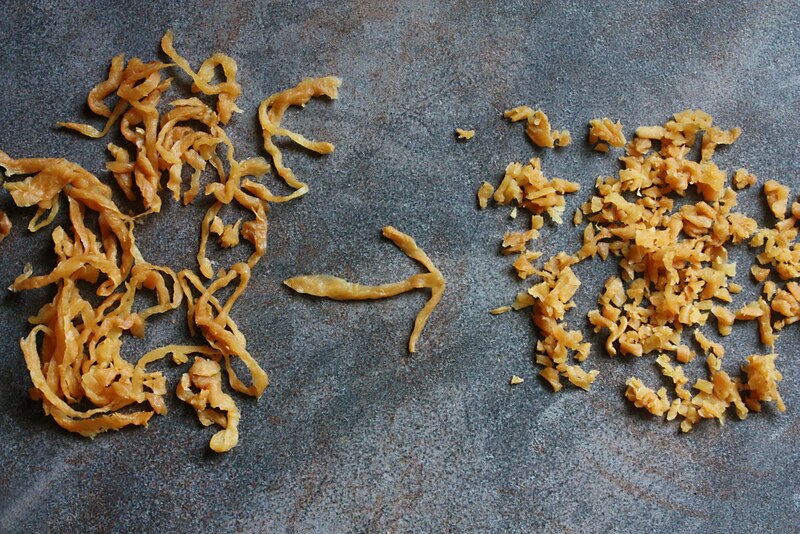 In the same post on the noodles, I’ve also cautioned you against blanching or par-cooking the noodles prior to stir-frying for that is the surest way to get your noodles to clump up and your Pad Thai completely ruined. In this post, I will be making comments and suggestions on the ingredients and garnishes that help make your homemade Pad Thai that much closer to the most common version found on the streets of Bangkok. 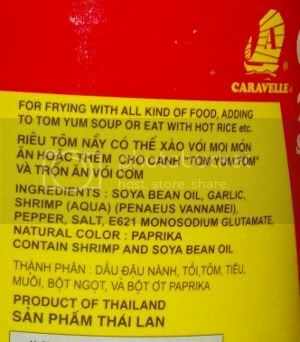 You may not have seen some of these ingredients before in all the versions of Pad Thai which you have had outside Thailand. But I can assure you that none of these ingredients is foreign to most Pad Thai enthusiasts in the motherland. And this is undoubtedly a yawn-inducing post to them for, you see, Pad Thai is such an ordinary food that is found everywhere in Bangkok, and these common ingredients are found right along with it. Everywhere. Every day. Almost all the time. A banana blossom wedge is featured as the cover image of this post, because I love this Pad Thai garnish so much. 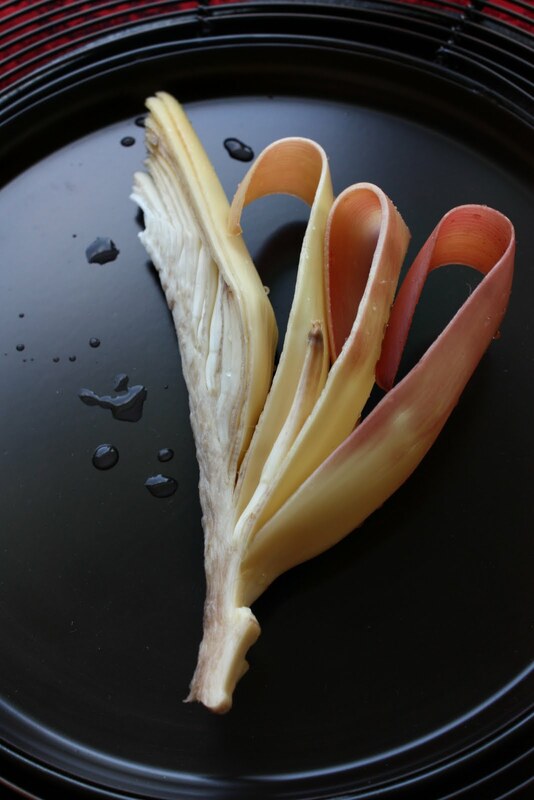 The tender heart of a banana blossom provides not only the crunch but also the very mild and pleasant astringency both of which I’ve found to be a perfect counterbalance for a dish like Pad Thai which, though does not taste greasy, contains quite a bit of oil out of necessity. So in this case, banana blossom wedges are not simply a garnish in the manner of that cute little mint sprig in your dessert which nobody really eats; they’re actually there to be eaten along with the fried noodles. The blossoms of one of the most common banana cultivars in Thailand, burro (nam-wa น้ำว้า), are tender, crunchy, fresh-tasting, and has no trace of bitterness. And they’re used quite commonly as a Pad Thai side/garnish. I’m feeling a little sad just thinking of how disappointingly tough and tannic most of the banana blossoms found in the US are, and how this has made it so hard for me to convince my American friends of how delicious, how tender, how sweet raw banana blossoms can be when most of the banana blossoms they have experienced are anything but delicious, tender, and sweet. 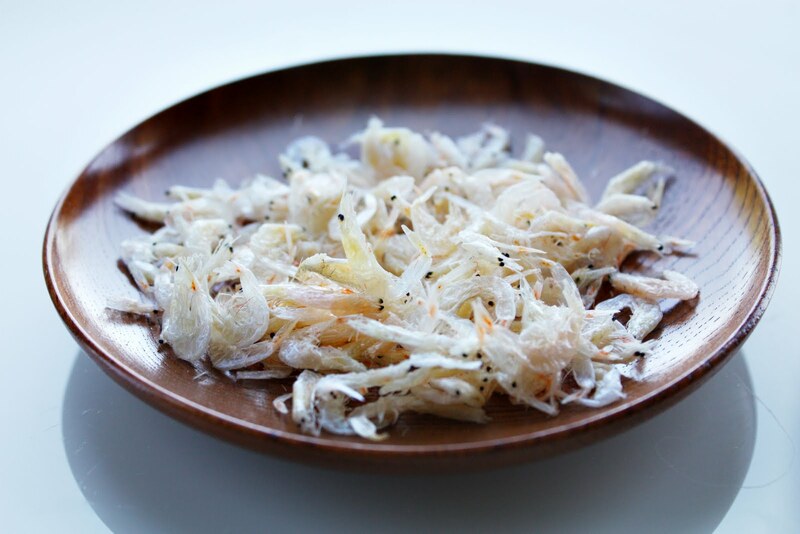 But there’s a way to make raw banana blossoms more enjoyable. Just remember to peel off all of the reddish outer layers until the pale yellow core is exposed. (This, sadly, means you end up throwing away more than half of each banana blossom you’ve bought by weight.) 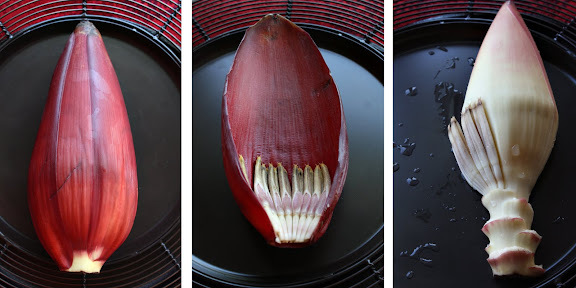 To use a banana blossom core as a Pad Thai garnish, cut it lengthwise in half then cut each half, on an angle, into thirds, making sure the core stays intact holding all the petals in each wedge together. Pick off and discard all the bitter little bananas that grow between the petals. Then plunge the banana blossom wedges into cold acidulated water (water and white vinegar) right away to keep them from turning brown. Keep them in the water until serving time, shaking off excess water beforehand. The best type of tofu for this purpose is the firmest you can find. They should not, however, be pre-seasoned; plain extra-firm tofu is the best. If you have access to extra-firm tofu that has been tinted yellow (found in the refrigerator section of most Asian grocery stores), by all means, use that for it is the best kind to use in Pad Thai. The yellow tofu is firmer than many brands of so-called extra-firm tofu and most appropriate for this task. 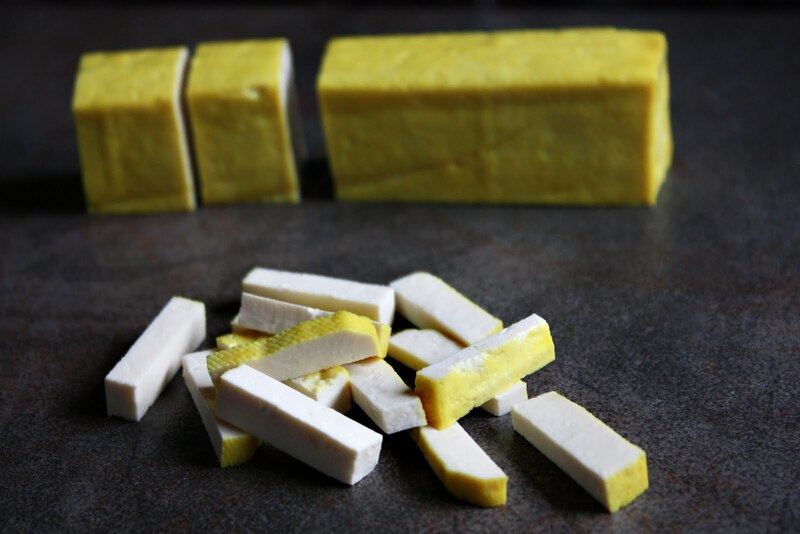 I cut my yellow tofu into short sticks, approximately 3/4 inch in length, 1/4 inch in width and thickness. But this is by no means a rule; as long as you cut the tofu into small, uniform-in-size pieces, you’re good. This ensures good interspersion; it also serves as a reminder that this is a dish born out of the post-war recession during which time people struggled to stretch every ingredient. If you can’t find yellow tofu, use the firmest tofu you can find; cut it into small sticks, and firm up the exteriors by searing them in a medium-hot skillet just to keep them from disintegrating in the pan. you don’t need extra water that would only make your noodles soggy. I have explained the reason for thick tamarind pulp in my earlier post on how to prepare tamarind pulp for Thai cooking, and if you have not read that post, I think at least a quick scan would be helpful. 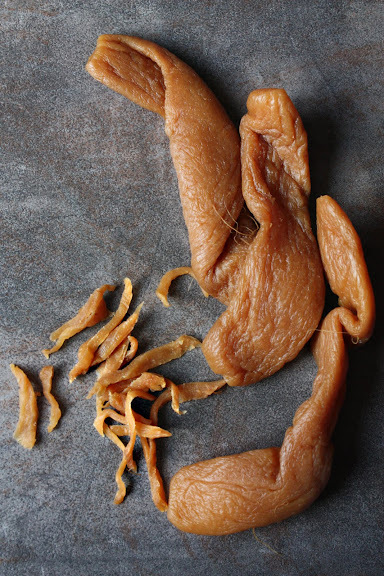 But to recap, the best tamarind pulp to use in Pad Thai — or any dish for that matter — is the kind you prepare yourself from fresh mature tamarind pods. I like to use shelled and deseeded tamarinds that come in a block. But if you can’t find those, use whole mature tamarinds found at most Hispanic markets. It will be more difficult to get the pulp out of them. Even so, it’s usually just a matter of removing the shells and soaking them longer in hot water as opposed to room temperature water. Also referred to as “salted/preserved/pickled turnips,” this is one ingredient that many Thai restaurants often leave out of their Pad Thai. Then again, if you’ve never had Pad Thai that contains it, you’re not going to notice that anything is absent. After all, the radishes are chopped so finely and used in small amounts that you can barely notice their presence. But try serving a plate of preserved radish-free Pad Thai to those who grew up eating it a few times a week, and they’d be mentally scratching their heads wondering what’s missing. There are two types of preserved radishes: one is salty (hua chai po khem หัวไชโป๊วเค็ม) and one is on the sweet side (hua chai po wan หัวไชโป้วหวาน). The latter is preferred. However, from my experience, people have a hard time finding this ingredient at all and don’t have the luxury of passing over one type in favor of another. So if you can’t find sweet preserved radishes, the salty variety is perfectly fine to use; just rinse them briefly with water and squeeze them dry. You see the arrow? You see the arrow? Hehe. I’m so mature. Salted/preserved radishes come in three forms: whole, cut into long thin strips, or finely chopped. Go for the finely-chopped version, if it is available to you, and if Pad Thai is the sole purpose of you buying these radishes. But if the strip version is the only available one, just line them up and slice them crosswise finely as shown above. I usually buy whole preserved radishes for they’re the most versatile. If you think the salted/preserved/pickled radish/turnip thing is confusing, meet our next ingredient: shrimp paste in oil. It will make you shake your head, wondering just how many kinds of shrimp paste are used in the various cuisines of Asia. 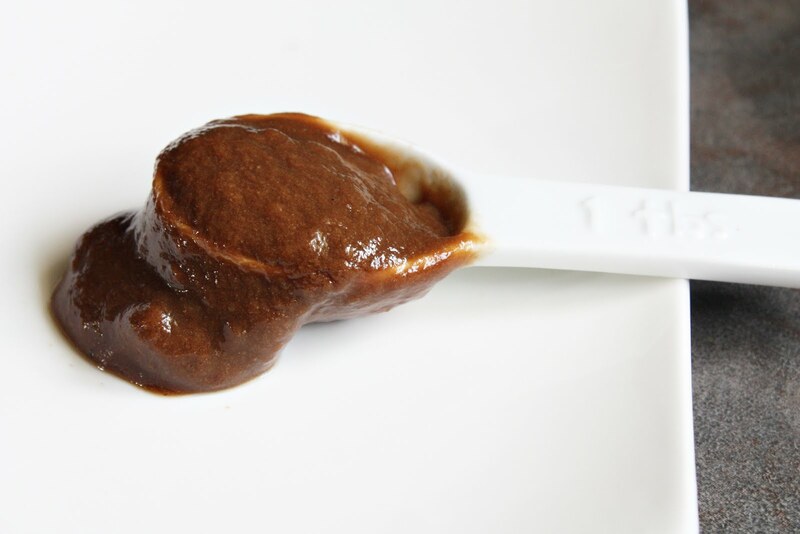 As you can see, this is not the purple-brown smooth shrimp paste (kapi) that is routinely used to make Thai relishes and curry pastes. This is made out of shrimp meat, soybean oil, and some other stuff that serves as either flavor or color enhancers. Needless to say, it’s not the most natural ingredient — or traditional, for that matter. It sure adds lots of flavor to Pad Thai, though. This is — for lack of a better way to describe it — an artificial means of mimicking the rich, savory shrimp tomalley (Man Kung มันกุ้ง) which is used in some high-end versions of Pad Thai. It’s also this reddish shrimp tomalley that lends its beautiful color to the noodles — something which people have tried to achieve by means of tomato sauce or ketchup. If you have access to fresh, natural shrimp tomalley, by all means, use that for there’s nothing better than the real thing. 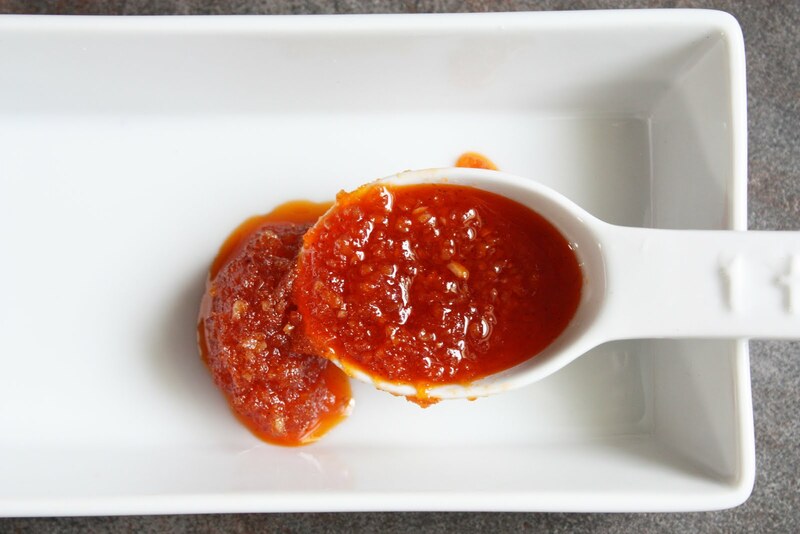 For the rest of us, the use of this shrimp paste to add the extra savory flavor and reddish color to our Pad Thai sauce will have to do. But this ingredient is completely optional. You can make delicious Pad Thai without it. Dried shrimp is also another ingredient which is often mysteriously absent from the version of Pad Thai found at most Thai restaurants overseas. Back home, it’s a must. Stand behind any street Pad Thai vendor and observe his or her mise en place, and you will spot a bowl of dried shrimp. They’re usually not the premium dried shrimp — the kind that’s headless, shelled, and flaky. These are the cheaper kind. They’re small and scrawny. You pop a few in your mouth, chew on them, and swear you can’t detect any shrimp meat — just shells. They’re sometimes even dyed red. And since they still have eyes, they stare back at you. Tiny these little guys may be, but they do play an important role in Pad Thai. If the only kind of Pad Thai you’ve had is made by Thai restaurants overseas, you may not even know that dried shrimp is a Pad Thai ingredient and its absence may not bother you at all. Bangkokian Pad Thai enthusiasts, on the other hand, will notice it right away if their noodles come without these crunchy, shrimp-y bits. I buy my tiny, shell-on dried shrimp from a local Korean or Japanese market. Go for tiny ones that still have the shells and, yes, the eyes on. Notice the leaves are flat, not tubular like other chive varieties. This is also known as Chinese leeks or nira grass. Maybe I haven’t dined in the right places, but I have never ever had Pad Thai outside of Thailand that contains Chinese garlic chives. At the same time — maybe I haven’t dined in the wrong places — I have never ever had Pad Thai in Thailand that does not contain Chinese garlic chives. The scent of garlic chives is one of the most prominent features of the kind of Pad Thai I grew up eating. And having to make do with Pad Thai that has green onions — or, worse, cilantro — in lieu of Chinese garlic chives at Thai restaurants overseas was (and still is) a big adjustment for me. 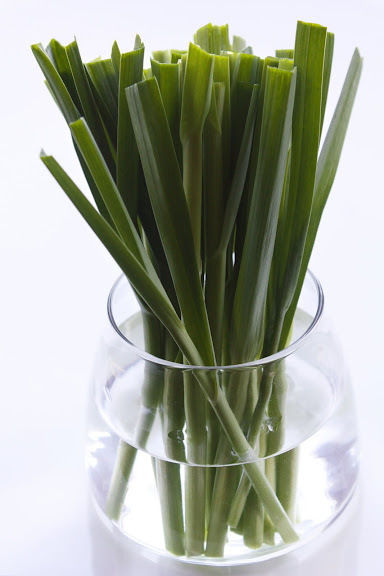 For each bite of Pad Thai, take a bite out of these fresh, crunchy, peppery chives. When it comes to Pad Thai, Chinese garlic chives serve not only as an essential ingredient, but also an essential garnish/side. Pad Thai without kui chai leaves in it tastes and smells wrong to me; a plate of Pad Thai without fresh kui chai on the side for you to eat along with the noodles also looks incomplete. If you’ve been trying in vain to recreate the kind of Pad Thai you’ve had on the streets of Bangkok, look at your recipe. Assuming everything else is right, if the recipe doesn’t call for Chinese garlic chives, that’s the reason your attempts have proved futile. 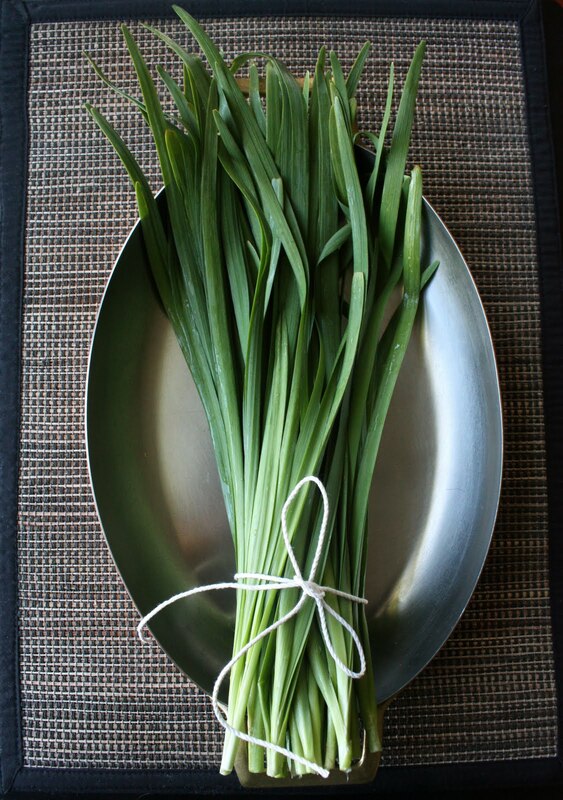 You can make decent Pad Thai without these chives. But if your goal is to create the Pad Thai as sold on the streets of Bangkok, you cannot leave them out. To prepare kui chai for Pad Thai, make a cut crosswise about 5-6 inches from the base and reserve the stalks to serve along with the fried noodles as a side vegetable. Cut the remaining tender parts of the leaves into 1-inch pieces and add them into Pad Thai along with fresh bean sprouts just before you take it off the heat. 1 These are made by pickling then dehydrating daikon. 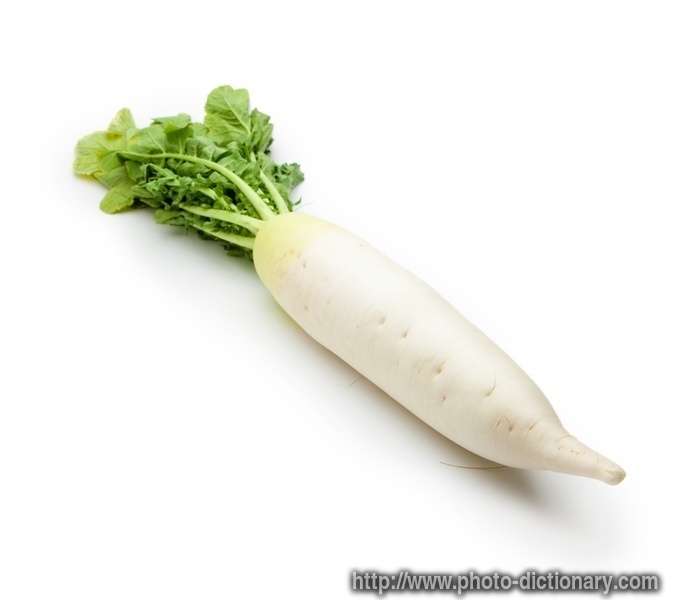 Do you call daikon a radish or a turnip? 2 Perhaps the proto-typical Pad Thai employed a different type of dried shrimp — possibly the premium, meaty kind that might not have been so expensive back then. After all, a Pad Thai recipe cookbook from my mother’s collection, dated to the early 60s, calls for the premium, meaty dried shrimp with an instruction to pound it in a mortar until flaky first (premium dried shrimp cannot be added to Pad Thai as is for, being so dense, they will go from pleasantly chewy to tough and rubbery.) Nowadays, though, it’s almost always this kind of smaller dried shrimp that is routinely used. 3 Think of someone whom you have seen for years with lots of facial hair. Now mentally shave their beard off and look at their face again in your mind. That is how I feel when I see a plate of Pad Thai without stalks of fresh Chinese garlic chives on the side. Fantastic post!! !Well, fantastic series of posts on pad thai! thank you for all that invaluable info!I swear I’ve had pad thai a few times in the streets of Bkk, but had no idea the recipe included half of the ingredients you mention! like the pickled daikon (i call it turnip, by the way, but maybe I got it wrong!) or the shrimp oil. My brother is over there now, so I may ask him to bring back some ingredients to give it a try to recreate a decent pad thai! Looking forward to your next post! So, I can actually get all of these items down the street from me in San Francisco. I have made various dishes with most of these items, just not Pad Thai, so I am eager to see the final recipe. The only things actually that I do not have in my refrigerator or cupboard right now, actually, are the Banana Blossoms (I can get those at a moments notice) and the dried shrimp (half a block away at the little Korean store) which I haven’t ever seen used in pad thai here. But I’m eager to try. 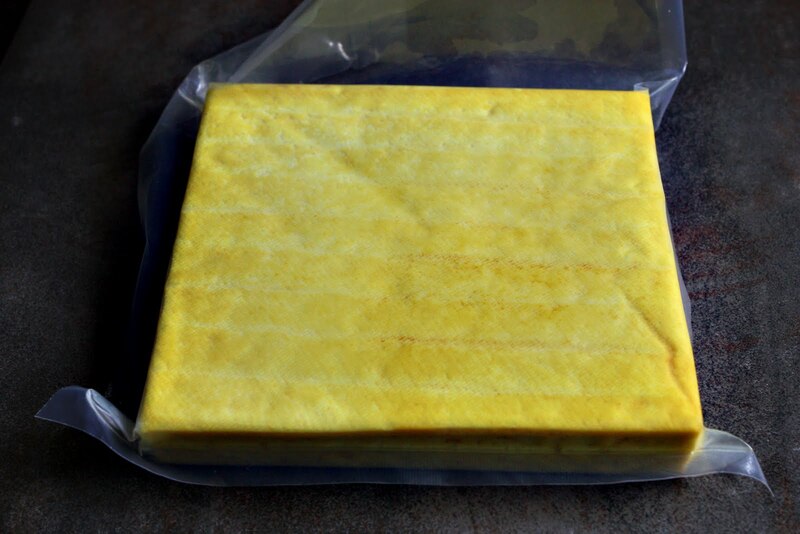 Oh and the yellow tofu…saw that in Bangkok, and I know we have it at the chinese store down the street, just never thought to ask for it. But I have chives, shrimp paste, and preserved radishes that I have used before in this dish. Wow what an informative series! Thank you. I have been trying to use recipes that I found on the Net and have been so disappointed. I even tried using the pre-made jar sauce. (yuck). I like where this is going and cant wait for the final steps!!!! Have you had a chance to post your recipe with all these great ingredients? Shrimp paste in oil is new to me, the rest familiar, but i am curious on your advice on proportions. Thanks! I second that, I am in desperate need of a good recipe! All that I have tried so far have not turned out well–not much flavor. Just discovered your site and am anxious to try out your other recipes as well. Hello! Thank you for the great recipe! I already made Pad Thai several times but due to problems with availability of ingerdients it always lacked dried shrimps, pickled radishes, banana blossom and chinese garlic chives. Recently I managed to buy pickled radish (it looks little different than what is on your photos – I hope it will suit) and dried shrimps. Unfortunately the only dried shrimps available were something like the ones you showed here: http://ingredients.shesimmers.com/2011/01/dried-shrimp-gung-haeng.html. I assume that they can be used but I would like to take your advice on how much of them should I add to the dish. Marc – I’d use the same amount (by weight not volume) and pulverize it before adding it to the recipe. To pulverize premium dried shrimp, if you have a coffee grinder, you can pop the dried shimp in and give it 3-4 seconds’ worth of blending. If not, soak the shrimp in warm water until softened, squeeze it dry, and pound it in a mortar until it becomes flaky and cotton-like in texture. Would nam prik pao http://www.amazon.com/Pantainorasingh-brand-Chile-Paste-Soyabean/dp/B000F6MOS0, be an acceptable substitute for the shrimp paste in oil? Belle – No. I wouldn’t use NPP in Pad Thai. If you can’t find the shrimp paste in oil, I would simply leave it out. In fact, in Part Five, you’d see that though I show a picture of a small bowl of shimp paste among the other ingredients, I didn’t use it in the video. A lot of people have a hard time finding this ingredient, and most Pad Thai vendors don’t use it these days, anyway. It’s just something I like. Hi there! I was stopped by some stores in Thai town the other day to look for some shrimp paste. I saw the Pantai brand and noticed there was a formula one and two. The only differences were that form1 used 60% shrimp meat and form2 ~38%(therefore cheaper). Are there any noticeable differences between the two in terms of taste? Thank you very much in advance! Love this site!! Matt – I have never used either one, but I doubt the difference in the amounts of shrimp meat means much in this application. What may make a difference would be the sodium content. If there’s a big difference, I’d go with the one that has less sodium. We want to keep that to the minimum. This is because we’re using this ingredient (which is optional, by the way) not as a seasoning as such, or even a source of salinity, but as a way of mimicking the fatty shrimp tamalley that is rich in umami. There’s enough salinity in the sauce. Hey, I’ve been trying to track down how you mix up the vinegar and water for “acidulated water” which you apparently use for keeping things like the bean sprouts crispy – do you have more about this somewhere on your site? Anon – Acidulated water is just plain water mixed with some sort of acid. In this case, lime juice, lemon juice, or vinegar can be used. For this purpose, I’d say a tablespoon of any of those things for every one cup of water should do it. If you’ve the time, I have pics posted of a couple things I’m not sure of. Boy I hope that doesn’t kick me into the spam folder with all those links … Anyway it says “tôm nâu bún riêu” instead of “gach tôm xao dau an” (sorry for the missing accents) – will it do, and if not, what CAN I use it for? in teensy letters on the back of the package. It says “Radish, Salt, Sugar – Product of Thailand” in the ingredients list. It seems rather wettish where I had the impression the stuff you are using is rather more the consistency of dried apricots. Plus, the string of Thai letters, as I was able to discern them, do not appear to match either of the two names you list for “preserved radish”. kitchenbarbarian – Yep, both products look fine to me. Thanks. I loved eating Pad Thai on the streets of Chiang Mai in northern Thailand…and in the restaurants there. (I find the Pad Thai in my city to be really heavy with oil and nothing at all like Pad Thai in Thailand). I have an app on my iPod Touch to warn the cooks and waiters, (in Thai), that I am badly allergic to shrimp/prawns. At best, I would end up in a hospital. What do you suggest as an alternative to shrimp, and shrimp paste in oil? Thank you for this great recipe and wonderful web site. Robert – I would simply leave them out. You didn’t ask about this, but I thought I would add that there’s shrimp paste and/or dried shrimp in several Thai dishes including most curries and anything that has nam prik pao (Thai chili jam/roasted chili paste) such some versions of tom yam, some salads, and some stir-fries. Hi. I made this recipe a couple of times and it was great. Just wondering if you know the shelf life of the salted radish? This was the only dish I’ve ever made that used them and I want to make it again. I assumed the salt would preserve it indefinitely, but maybe I need a new bag. It’s been at least a year. They look the same, no noticeable mold or bad odor, but maybe I’m fooling myself. Thanks!